RIAs, it’s time to rethink…. Last year, Roger Ibbotson wrote a groundbreaking white paper, showing a smart alternative to bonds in retirement portfolios. But NOT ALL bond alternatives are created equal. Now the next chapter in the research from Zebra Capital highlights the performance advantages of a behavioral finance-based index in an FIA. For all further questions get in contact with your CreativeOne team today at 800.992.2642! 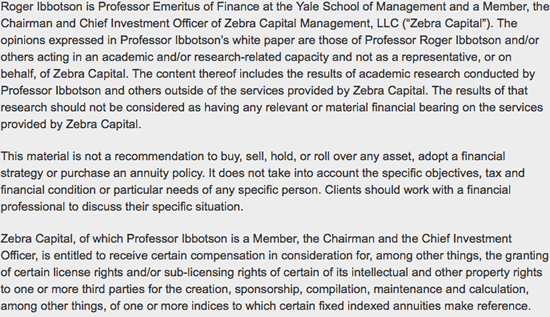 Neither Roger Ibbotson or Zebra Capital are related to or affiliated with CreativeOne.